Indulge in a day of fun with your favourite cartoon characters as you explore two different themed parks. Step into the world of Hello Kitty and get aboard Thomas the Tank Engine as you discover the wonderful world of cartoons and enjoy the perfect family day trip from Singapore. Discover the Sanrio Hello Kitty Town and explore the home of Hello Kitty and friends. Enjoy meet-n-greets, live performances and interactions with Hello Kitty at Hello Kitty Town as you explore upto 10 different attractions. Learn ballet moves at Angelina Ballerina’s Dance Studio, be a part of Bob’s Can-Do-Crew, play games with Pingu the penguin and enjoy a live show of Barney and friends at Thomas Town. With plenty of rides,activities and attractions, there’s something for people across all ages. Hello Kitty Town is an absolute treat for all members of a family. At the venue you can indulge in a fairytale adventure all over. Create your own themed souvenirs, watch multiple performances by Hello Kitty and friends or enjoy fun-filled party spaces with your favourite themed characters all in the same place. A special zone dedicated to Thomas the Tank Engine, Thomas Town is where adults come to become kids again. Meet your favourite characters including Barney the Purple Dinosaur, Sir. Topham Hatt, Bob the Builder, Pingu, Angelina Ballerina and more. Indulge in a variety of interactions, games, dance classes and more as you go on a ride with Thomas and his friends. Dive into the world of Hello Kitty and see the wonderland all around you. Explore the mystical land of Hello Kitty in Oz, where you will experience a fascinating story of bravery and friendship. Take a tour of the Hello Kitty House and complete simple tasks, a favourite among kids and watch Hello Kitty and Friends put on a performance just for you and your loved ones. A truly special event. Be sure to take home plenty of pictures in the Dream Photo Garden and don’t forget to make your own souvenirs at the Wishful Studio. 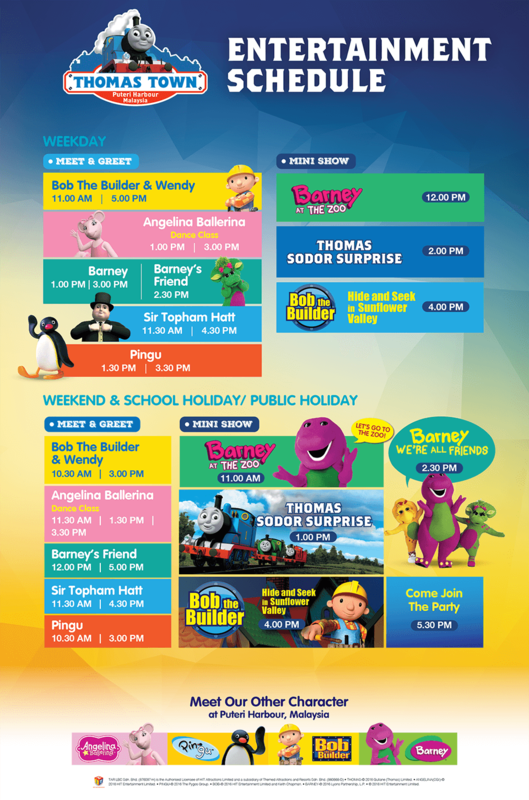 Get aboard the world’s favourite train, Thomas and enjoy a day with the most beloved cartoon characters at Thomas Town. Enjoy a meet and greet with Barney, Topham, Pingu, Bob and many more characters. Go on a road trip with Bertie the Bus, soar across the skies with Harold’s Helitours, experience a rush of adrenaline at the Colin Crane Drop Ride and take a tour of the Knapford station aboard Thomas. 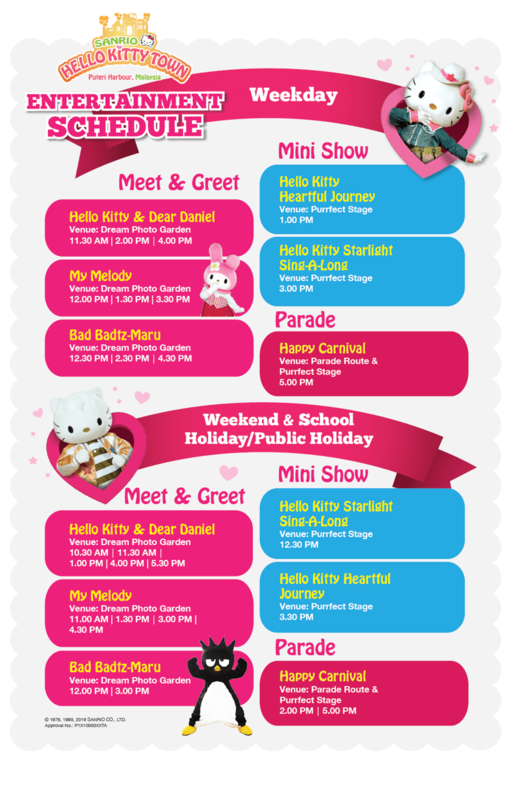 Check out the daily entertainment schedule at Hello Kitty Town and Thomas Town and plan your day accordingly. Children aged 0-2 will not be charged. However, if the child is taller than 90cm please carry an identity proof to avail the free entry. Locker Rooms are available for a daily rental of RM 10/RM 20 per day depending on the size of the locker. All travellers need a minimum passport validity of 6 months to leave Singapore. Carrying your original passport is compulsory. You will receive an email with your Hello Kitty Town ticket voucher. No need to print. Present the mobile voucher along with your passport at the entrance ticketing counter and swap your mobile voucher for your paper tickets. You may redeem your voucher any day before March 31, 2018.